Thanks, Fabric Worm! My scrap pack arrived today. Isn't it a cute bundle? I won because I participated in the BOM @ Quiet Play. These blocks are so cute! And also a big thanks to Kristy! 3am. Couldn't sleep. Made a simple quilt back for my Buckeye Beauty (the mystery quilt from Made With Love by Mary) blog. There were two squares left over from the mystery quilt instructions. They are now on the back with these subtle pink stripes. 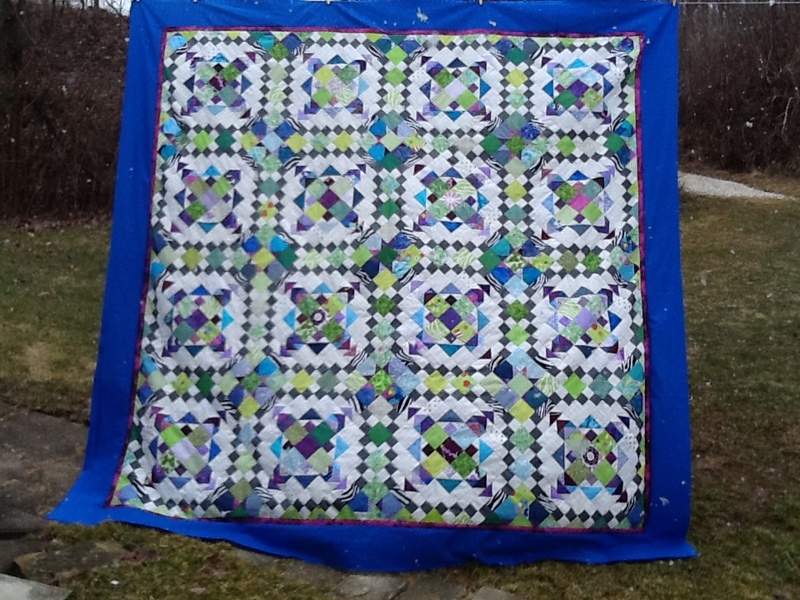 Add another quilt to the longarm pile. Sadly, March was a busy busy month. I was only able to longarm about five days of the month. April will be better! I finished my Buckeye Beauty Mystery quilt at Made With Love by Mary's blog. I made one of two blocks for my LQG challenge. This one is Lee's Ribbon Star pattern at Lee's blog, Freshly Pieced, here. Before the deadline I finished and mailed the MMMRR13 to the next quilter! I finished my Easy Street quilt top (mystery from Bonnie Hunter of Quiltville). I finally received all of the Tall Fly blocks that I won from the January Block Lotto. Whohoo! 5. Spring Mystery loaded 2/26/13 Eyelashes to rip out! Here's a Ribbon Star block that I made for my local quilt guild for the "Stars in Blue" quilt challenge. I love this block. You can find the pattern at Lee's blog, Freshly Pieced, here. MMMRR13 March Sneak Peek & Hands 2 Help! Whew! Just in time to get it mailed to the next person, my March part of the Modern Mystery Mini Round Robin 2013 is complete. It will be in the mail tomorrow. It's not a moment too soon, because the next one should be here on Monday or Tuesday and I need to get those ideas flowing on it. I will be donating a quilt to Happy Chemo this year in efforts to collect 1500 quilts. I will be doing this through the Hands2Help Charity Quilt Challenge 2013. Check it out at Confessions of a Fabric Addict blog. FNSI Results -- Easy Street Quilt Top Complete! For my FNSI results this month I'm excited to show my completed quilt top for Bonnie Hunter's Easy Street Mystery Quilt. This quilt is soooooo busy. I'm glad that the border toned it down a little. It's huge. Now I need to make a back and think about how to longarm it. Decisions decisions. Any suggestions are welcome -- as always! Look at those big fluffy snow flakes in the pic. Welcome, Spring. Check out all the progress the others have made on their FNSI's! All the Tall Fly blocks made it home from the January Block Lotto, 2013. I love the tomato inspiration colors of red, green, and black. I'll need my thinking cap on how to arrange these blocks. For the FNSI (Friday Night Sew In) I plan to work on piecing my Easy Street blocks that are finally complete! I still can't believe that I am this far at piecing this quilt. I can't say that it is one of my favoarites (yet). It's a lot of pieces. I need to do the math. But I do know that I am tired of moving the heavy bin of the large pieces and all the fabrics that I pulled for the quilt around from place to place to get to my strip die cutters. So Friday nights's the night that I hope this puppy gets put together into one big top. Wish me luck! Hook up at Handmade by Heidi's FNSI. I finished my Scrappy Swoon Along! Whohoo! Here's the block I made for Melissa for the Block Swap Adventure. I completed my nine "Steps" blocks for the March Block Lotto. I'm all caught up with Mary's Mystery quilt instructions. (Then I did the next step and sewed these in to rows -- not pictured). I finally finished all 16 big Easy Street Block As. About five more Block Bs and we can call this a quilt top! I'm tired of moving that bin around. It needs to get done. This is the QA at Terry's Treasures. It's scheduled to do a row a month. These little blocks went so quickly together that I couldn't stop and now it's a finished top. I put it together a little differently than the instructions. I'm really happy with all the pink scraps. Gotta love chain piecing! 6. Tall Fly (January Block Lotto) ONE package to go. I don't think it's coming. All alone these blocks don't do much for me. But when you put this quilt together and set it on point it's AWESOME! I'm glad I stuck to the same colors that Bonnie Hunter did this time. OH, check out my sidebar. Grab your Crista's Quilts button while it's hot! I'll start cutting on that Hugs & Kisses QA as soon as I get my five Easy Street Blocks done and my Easy Street stash scraps put away. These little blocks go together so nicely that I added a couple rows to my Terry's Treasures Sew Along this weekend. Sewing the little squares together is almost mindless sewing. Everybody needs some chain piecing once in a while. You can find Terry's blog here. I'm all caught up with the Made with Love Mystery Quilt. Here are my blocks from step 5. This quilt along has been fun. I'm using fabrics in low volume colors (that I fell in love with during the February Block Lotto blocks this year). Almost all of these fabrics were from my friend, Judy. Her sewing group was going to throw them away and she scooped them up in a bag for me. Some of the pieces were only 4" square. I LOVE it! You can catch up to Mary's blog here. These piles are really only two blocks, Block A and Block B. Some have the dark (grey) going through the center squares. Some have the dark (grey) as the HST on the corners. What a dull, gloomy photo. But you get the idea. Can't wait to sew these puppies together and hang it on the line in the sunshine! 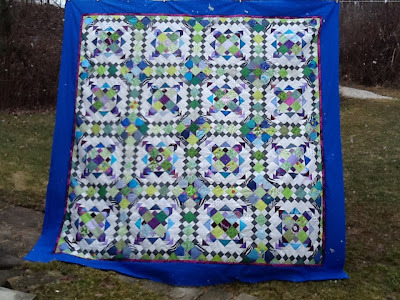 I'm also happy to link my finished Scrappy Swoon Along this week to Link-A-Finish FRIDAY with Richard and Tanya Quilts! This month's block for the Block Swap Adventure was for our fearless leader, Melissa. Thanks again, Melissa for stepping up and taking over the Block Swap Adventure. I hope you enjoyed your cat block with purple background. It's kinda bright. What can you do today to brighten someone's day? I copied this from Michelle's blog. My Scrappy Swoon Along is finally complete. Whohoo! I quilted it with feathered leis and feathered circles. I'm really happy how this quilt finished. I really like the starry binding. I did put a mini border on it because I don't like to longarm over all the pieced squares. I like the effect with the heart border and stary binding. Thank you, Jennifer, Hopeful Homemaker Blog, for hosting this QA. The step-by-step instructions were so doable. The 3.5" squares and HST were cut with my Accuquilt GO! Baby. This helped me utilize my scraps effectively. The quilt found a happy home as a Quilt of Valor with my childhood friend, Steve, who now resides in Brazil. He is retired from the US Navy. This also meets my goal for March for A Lovely Year of Finishes!!! Now that this QA is done, Jessica at Quilty Habit blog has an Argyle QA that is very tempting. I finished the top to my Scrappy Swoon Along. Here's the scrappy back for the Scrappy Swoon Along (with the QOV label). 7. Scrappy Swoon Along (loaded on the frame 3/11/13).